“This is my work and my glory—to bring to pass the immortality and eternal life of man” (Moses 1:39). 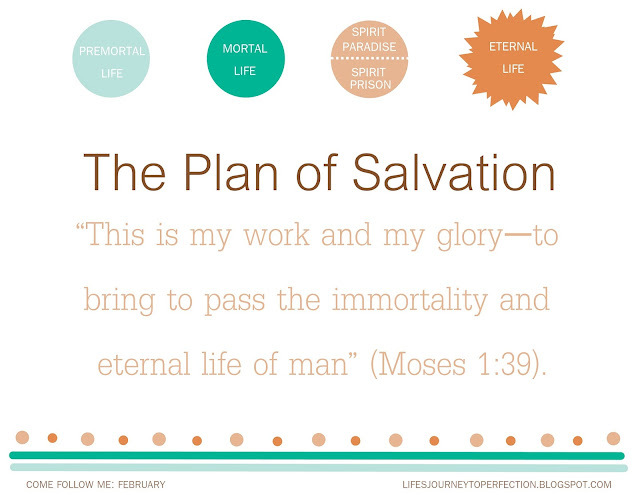 What is the plan of salvation? 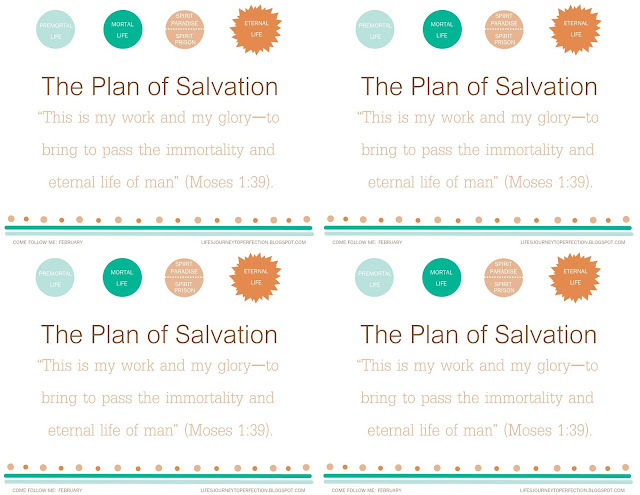 HERE is a link to a FHE that I did with my family about the plan of salvation. It was a FHE that our whole family enjoyed. There are also free printables to help teach. 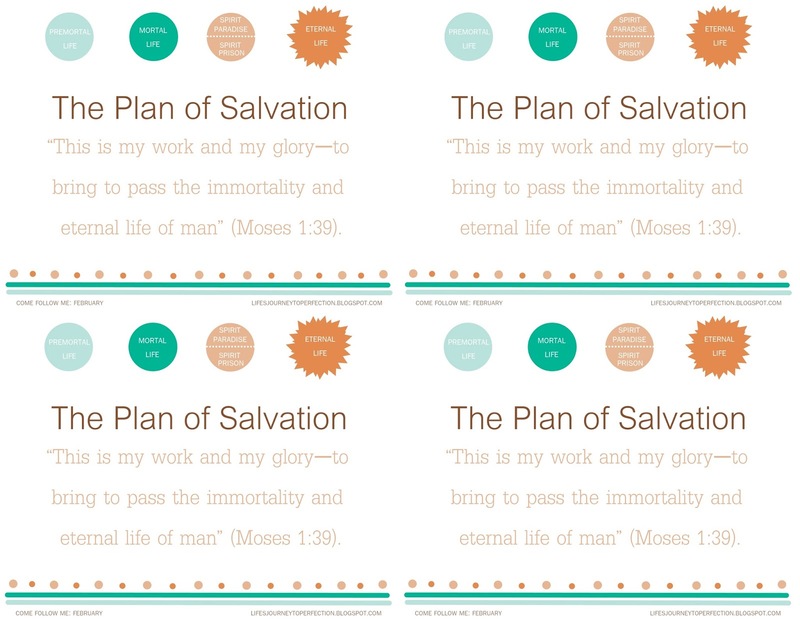 Or HERE is a link to a Primary sharing time that I did about the Plan of Salvation with more free printables. What happened in my premortal life? Write on the board, "Premortal Life". Divide the young women into three groups give each group the paragraphs about Premortal life found in the True to the Faith Book, pg 115-116, Invite them to read the paragraphs together in there group and discuss the premortal life. Then invite everyone to come together and share with the rest of the class what they have discussed about premortal life. Read together D&C 138: 55-56. Discuss with the class how they are one of the noble ones, that they were prepared in the premortal life to come at this time where they can use their talents and abilities to build the kingdom of God. Invite the young women to work on Individual Worth value experience 1 in Personal Progress. What is the purpose of life? Write on the board "What is the purpose of life?" Invite the young women to write on a post it note, what they think the purpose of life is and then have them come and post it on the board. Discuss each post it note as a group. Invite one of the young women to read the following quote, "During this life we obtain physical bodies and are tested to see if we will obey God’s commandments. We came to earth to prepare to have an eternal family, bless God’s children, and build His kingdom. Our experiences during mortality are meant to help us become more like our Heavenly Father." Break this quote apart and discuss each piece with the young women. Discussion about physical bodies might include how to treat our bodies with respect (modesty, word of wisdom and appearance); Discussion of obedience to God's commandments could include showing this video: Obedience to the Ten Commandments; Discussion on Eternal families might include: Plan of Salvation - We’re Still a Family; Finish by discussion that everything we experience in the life is to help us become more like our Heavenly Father and to help us reach our potential. Why do the choices I make matter? Begin by drawing a V on the board. Explain to the class that if they started at the bottom of the V, they would have to choose which side of the V they would walk on, they could not walk on both. Then write on the board, above the V "Why do the choices I make matter?" Invite the youth to share their answers. At the top of the right side of the V write, "Eternal Life with our Heavenly Father". On the other side (left side) write "Unhappiness & Misery". Invite the youth to take turns reading a paragraph of, "Agency and Accountability" After, the first paragraph stop and discuss the importance of our Agency. That a great war in Heaven was fought over our agency. But with our agency also comes consequences and the responsibility to use that agency correctly. Invite a youth to read the second paragraph. Then show the movie, "Dangerous Tides” Discuss how we can be an example for others to follow, whether for the good, or for the not so good. Give the youth some scenarios and let them decide whether this would put them on the right path or the wrong (left) path of the V. Invite a youth to read the 3rd paragraph. Discuss consequences that come from our decisions. Invite the youth to share some of the consequences that would occur from the scenarios placed on the board. Emphasize, "While you are free to choose your course of action, you are not free to choose the consequences." (Agency and Accountability). If you feel the need explain that our Heavenly Father has provided a way for us to get off of that wrong "left" path and that is through the atonement of the Savior. Draw a bridge from the left side to the right side. Write the words Atonement and Repentance underneath. Explain that we can repent from our wrongs and get back onto the right path. Also, explain the importance of remaining steadfast on the right path and pressing forward. Why do we have adversity? Begin by showing the youth some graphite or a graphite pencil, then show them a diamond (if you do not have a diamond, just show them a picture of a diamond). Ask the youth what is the similarity between the two and what is the difference between the two. The similarity is that they are both made of carbon. The difference is diamonds are harder and worth more than graphite. They are also beautifiul. Explain that for the diamond to become a diamond. The carbon is put under immense pressure and extreme temperature. Explain that Heavenly Father knows our potential and He knows we need to get us there. Just like the carbon goes through extreme pressure and adversity to become the magnificent diamond. We will go through pressures and adversities to reach our magnificent potential. Give each girl a piece of paper, invite them to fold the paper in half, open it back up, then draw a line down the center on that fold. At the top of one half of the paper have them write, "Why do we have Adversity?" on the other half have them write, "What can you do when adversity comes?". Invite the youth to write on their paper what they receive as answers to these questions as they watch the following video. Show the following video: "God will life us up" Invite the youth to share their answers and discuss as a group. How can I find comfort when someone I care about dies? Give each youth a piece of paper. Invite them to spend a minute writing down any questions or fears they have about death. Invite them to throughout the lesson invite the Spirit to touch their hearts that their questions might be answered. Play the video, "We're Still a Family". Break the talk Door of Death, up into sections give the sections to the youth. Invite them to read and ponder their section and then invite them to share what they have learned with the class. Invite the youth to share any questions they have that have been answered and what their answers were. If they have unanswered questions, invite them to share them and work on finding the answer together. Why should I treat my body like a temple? Begin by explaining that Heavenly Father has given us an amazing gift!! Show the youth the gift bag (inside will be a mirror). Invite one of the youth to open the gift and to show everyone what is inside. Explain that Heavenly Father has given us our bodies. Ask the youth why it is important that they have a body? Why do they feel that their body is a great gift from Heavenly Father? Discuss with they youth how our bodies are temples of our spirits, it is where our spirit dwells. Show the youth a picture of the temple. Invite them to discuss how they feel as they look at the temple. Why is the temple special? Now invite the youth to pass around the mirror, explain to them as they are passing around the mirror that their bodies are sacred and special just like the temple is. Play the video 195 Dresses. Discuss modesty as a group (discussion might include, that when we dress immodest then we are sending the wrong message to others, but as we dress modestly then we are showing ourselves respect.) Invite them to share why modesty is important to them. Invite one of the youth to read 1 Corinthians 3:16-17. Also invite the youth to read and discuss Dress and Appearance in the For Strength of Youth. Close by showing the video Deep Beauty. 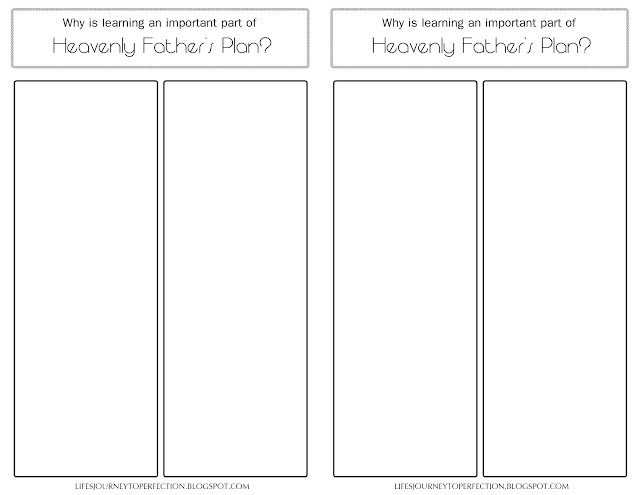 Why is learning an important part of Heavenly Father’s plan? 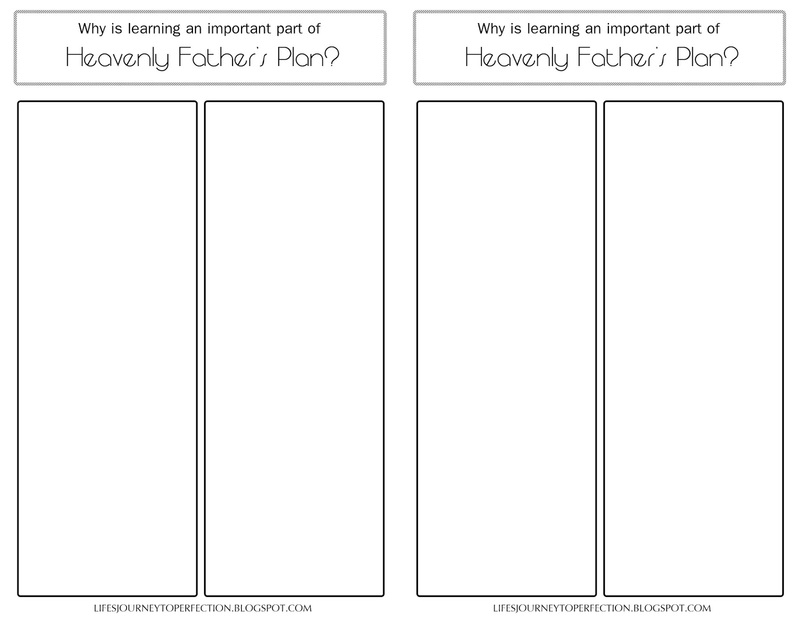 Give each of the class members the printable that says, "Why is learning an important part of Heavenly Father's Plan" Invite the youth throughout the lesson to ponder and take notes to answer this question. Together, read through, "Education" from the For Strength of Youth Pamphlet 2011, pg 9-10. Invite the youth to share what Heavenly Father asks of them. Then invite the youth to share what blessings they will receive if they follow our Heavenly Father's council. Play the video, "The Glory of God is Intelligence" Discuss the what they youth learned from the video as to the importance of learning. 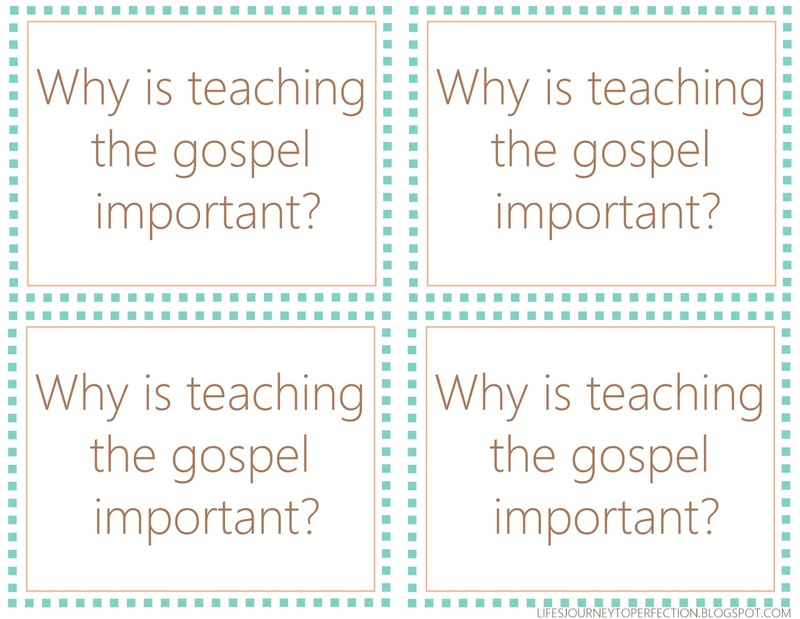 Why is teaching the gospel important in the plan of salvation? 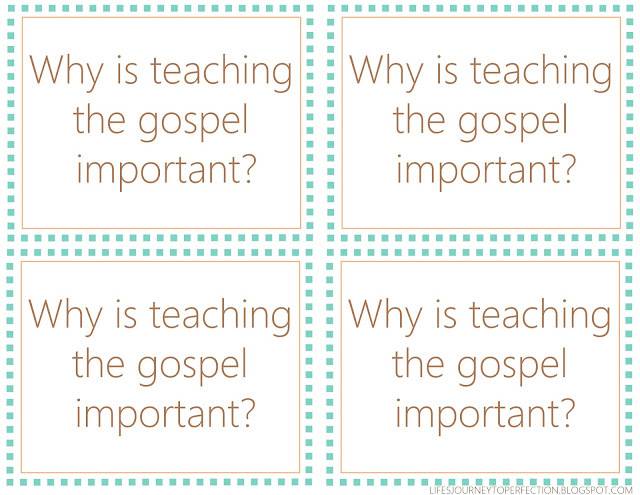 Give each of the youth a card that says, "Why is teaching the gospel important?" Invite them to read the card and throughout the lesson to think about that question and try to receive a personal answer to that question. Invite the youth to take any notes they would like to on the back of the card. Show the video, “Teaching Helps Save Lives”. Invite the youth to share what they learned from the video. Invite a youth to read, "In order to fulfill the purposes of the plan of happiness, Heavenly Father’s children need to learn about the gospel. For this reason, God needs each of us to teach the gospel to our families, to other members of the Church, and to those who haven’t received the gospel." (lesson heard on lds.org Come Follow Me, February: Why is teaching the gospel important in the plan of salvation?) Discuss ways they can apply the things they have learned about teaching into their own lives. What is the role of agency in learning the gospel? Discuss the parable of the 10 virgins. Explaining that 5 of them used their agency to fill their lamps and have extra oil, while the other 5 used their agency to not do so. When the time came for the bridegroom 5 of the virgins did not have enough oil and the other 5 could not give of their oil to them. Invite the youth to share how that parable can correlate with us using our agency in learning the gospel. Give each of the youth a copy of, "Learning by Faith: To Act and Not to Be Acted Upon". Invite them to pay attention to what Elder Bednar, suggests ways they can take more responsibility for their gospel learning. Invite them to share ways they can apply the counsel given in their own lives. How can I help others participate in learning?